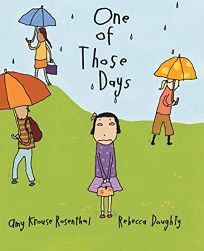 Krouse (Cookies: Bite-Size Life Lessons, reviewed June 5) begins with a hard-to-disagree-with proposition: ""Some days are just not as great as others. Some days are one of those days."" She then enumerates some examples, from the comically irksome (e.g., ""One Freak Hair Day,"" ""Itchy Sweater Day"") to the infused-with-existential-dread (""Feeling Left Out Day,"" ""Sad For No Reason Day""). While the roster is emotionally astute and authentic, the book would be a quick flip-through at best (at the end, readers find the author's assurance that even the worst are followed by ""a brand-new day""), if not for Doughty's (31 Uses for a Mom) scraggly-inked drawings. Her gawky-limbed, poker-face characters act as the ideal conduits for expressing life's little and big disappointments; at the same time, Doughty's wry, editorial sensibility fleshes out the skeletal text. For the ""Answer To Everything Is No Day,"" a girl assumes the pose of a supplicant in front of her implacable mother; a comic-strip balloon over the girl's head indicates that what she's begging for is that ne plus ultra of unfulfilled wishes, a pony. Still, the text's overtone of sullenness feels more appropriate to a tween audience. Ages 4-8.